Nearly ubiquitous in a diversity of deciduous, mixed, and coniferous forests and (not-too-wet) swamps, clearings, and shores; but also common in dry sandy forests (jack pine, oak, etc. ), roadsides, and fields; along railroads, on dry rocky summits and bluffs, and in grassy places. Although more often in dry open sunny places than F. vesca, may grow with it. Flowering specimens, especially, of F. virginiana and F. vesca are not always easy to separate. The mature leaflets in F. virginiana are ± dark or bluish green when fresh and (especially the terminal one) usually distinctly petiolulate; the peduncle at maturity is generally shorter than the longest petioles; the flowers tend to be larger (petals up to 12 mm long). In F. vesca the leaflets are a brighter green and sessile; the peduncle at maturity usually exceeds even the longest petioles; and the petals are less than 7 mm long (often as short as 4 mm or even smaller, but in F. virginiana they may also be less than 7 mm). After the petals have fallen, the attitude of the calyx lobes seems to be as dependable a character as any for distinguishing the species. Most cultivated strawberries are derived from the hybrid F. ×ananassa (Weston) Rozier between F. virginiana and F. chiloensis (L.) Mill., the beach strawberry, from Pacific Coastal regions of North and South America. 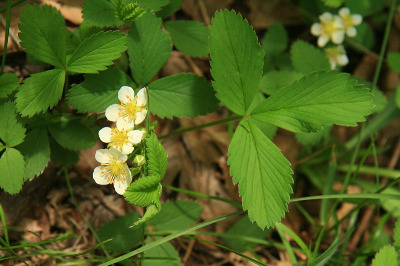 Garden strawberries may rarely escape or more likely merely persist for a time after cultivation, and specimens are known from Antrim, Kalamazoo, Keweenaw, and Wayne Cos. They differ from F. virginiana in having achenes barely if at all sunken on the ripe receptacle, which is much larger; in coarser foliage; and in consistently bisexual as well as larger flowers (those of F. virginiana sometimes are unisexual). MICHIGAN FLORA ONLINE. A. A. Reznicek, E. G. Voss, & B. S. Walters. February 2011. University of Michigan. Web. 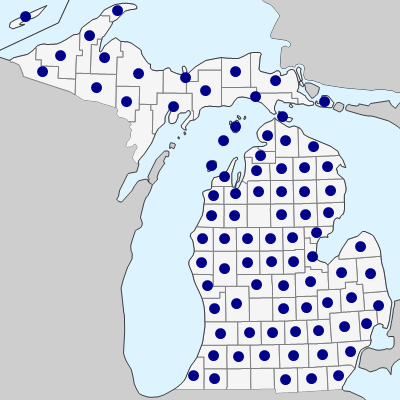 April 21, 2019. https://michiganflora.net/species.aspx?id=2483.